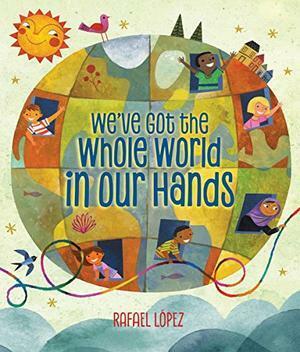 We’ve Got the Whole World in Our Hands adapted and illustrated by Rafael López is a lively picture book based on the original hymn, He’s Got the Whole World in His Hands, which has now become a popular member of the folk music genre. The words joyfully invite children and animals from all over the world to sing, dance and clap together in celebration of the sun, the wind, nature and each other. The illustrations are expansive, colorful and captivating in the details such as a picture of a boy carefully studying a snail that sits protected in the palm of his hand. The author-illustrator has used a variety of approaches from collage to photoshop to create the eye-popping pictures of children playing in the sun and singing in the rain. One of the most outstanding illustrations is a vertical two-page picture layout of a hot air balloon rising in the night sky full of smiling children from many cultures. Also, a monkey, a giraffe, a gorilla and a rhino are pleased to be aboard. One scene after another is held together by a constant unrolling of a ball of multi-colored yarn which visually holds the unity of the pictures and the world together. This balances well with the rhythmic repetition of the song’s words and refrain which auditorily hold the story together. We’ve Got the Whole World in Our Hands adapted and illustrated by Rafael López and offered in both Spanish and English editions, is an energetic and multi-generational “read and sing” for parents, grandparents and young children 3-5 years of age (Orchard Books/ Scholastic, 2018). Work with young children to help them play an “I spy game” by finding the following details in the double-page yellow illustration showing the children and the animals walking, sitting and playing on ropes made out of multicolored yarn: a red flower, a snake, a blue bird, a hedgehog with flowers in its hair, a duck, a raccoon, a moose, a squirrel, palm trees and a boy shaking maracas. Introduce them to France’s Eiffel Tower, Italy’s Leaning Tower of Pisa, Mexico’s Mayan pyramid and the minaret where the faithful in the Islamic world are called to prayer. To understand the role that the ball of colored-yarn visually plays in this story study what the children do with it on each page. See how they play with it and follow it. How do the birds help connect the whole world with this yarn? Find a picture in the book where the children are playing tug of war with it, using it as a jump rope and playing a string-game called Cat’s Cradle. Can you play these string games? Get some yarn or string and try them out. If you have never played string-games older siblings or parents and grandparents can teach you. HAVE FUN! Be sure to sing the song. Parents and grandparents will know the tune. The music is available at the back of the book.